The hotel will be under ongoing renovations throughout the entirety of 2016. 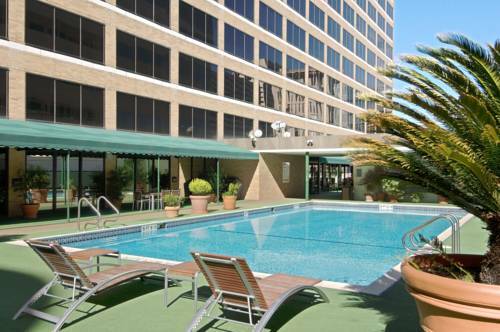 The Hilton Houston Plaza/Medical Center hotel is located in the Heart of the Texas Medical Center in Houston Texas. The hotel is conveniently located near Rice University the Museum District of Houston MD Anderson Cancer Center St. Luke*s Hospital Texas Children*s Hospital Texas Heart Institute Herman Hospital and Transplant Center Baylor College of Medicine and the UT Health Science Center. In addition the Reliant Center George R. Brown Convention Center Toyota Center Minute Maid Park and Reliant Stadium are all only minutes away. The Hilton Houston Plaza/Medical Center hotel provides the finest and most stylish accommodations with 141 luxurious suites and 42 deluxe guestrooms. Adding to your comfort each Hilton hotel guestroom features a host of hotel amenities including a full wet bar refrigerator multi-line telephone voicemail data port access cable TV and in-room movies. Wireless Internet is available through Comcast for an additional fee. Our state-of-the-art health club includes a private outdoor jogging track and outdoor pool. For outstanding food and refreshments guests need not look outside of our Hilton Houston Plaza/Medical Center hotel. The expert staff at our own Garden Court restaurant prepares a variety of enticing menu items. The Hilton hotel Shamrock Bar is the perfect spot for some quiet time or conversation with friends. The hotel is located inside the Loop of Texas Interstate 610 just 5 miles from the Houston Galleria Shopping Center 25 miles from George Bush International Airport and 10 miles from Houston Hobby Airport. For a top-notch stay in Texas - Take me to the Hilton. Travel should take you places. Casual dining. This full service restaurant specializes in continental cuisine and features a heart healthy menu. It offers a quiet and soothing place in which to start the day or unwind in the evening. Serves breakfast lunch and dinner. - Shell Oil Bellaire Technology Cntr. - George R. Brown Convention Cntr.